The Dallas-Fort Worth Metroplex has one of the largest concentrations of corporate offices in the United States. This thriving metropolis is home to 18 Fortune 500 companies, and it hosts almost 136,000 small businesses, putting it at seventh place among all American metropolitan areas. Keeping the floors of these enterprises clean is a big business in Texas. 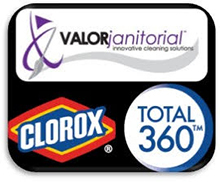 Service providers like Valor Janitorial flourish because organizations are perpetually seeking innovative and cost-effective solutions to maintain the cleanliness of their working environments. Indeed, ,aking sure that offices are spotless and sanitary is important if a company is to protect the health and well-being of its associates. In between the cleaning services we provide, there are many things you can do at the office that can help you keep your floors clean. Read on and discover some of these helpful tips. Place mats on doorways – One of the cheapest and easiest ways to keep dirt and debris from entering your office is by rolling out mats at the doorway. Your can get one of those scraper mats that can aggressively scrape dirt and grime off your employees’ shoes, lessening the amount of soil that gets indoors. Sweep and vacuum floors regularly – In between regular professional cleaning, your cleaning staff can sweep and vacuum the floors regularly to prevent dirt and debris from accumulating. Dry mop hardwood floors – Hardwood floors can be ruined by wet mopping, so make sure to only use a dry mop when cleaning. If a spill accident occurs, quickly blot the liquid that has spattered on the floor to prevent the hardwood from getting soaked. Drying the floor immediately will also help prevent the wood from discolouring and from warping. Applying floor wax can also help with keeping hardwood clean, but make sure that your are using an appropriate product for your floor. Also keep vinyl flooring dry – Soaking vinyl floors in water is not recommended because the liquid can seep underneath and ruin the glue that lets the vinyl adhere to the ground. Simply use a damp mop when cleaning vinyl floors. Apply soil retardant on carpets – Carpets need to be vacuumed more often than other types of flooring materials because dirt and grime can get very deep into its piles or weaving. You can also treat your carpet with soil retardants in order to protect the carpet fibers from stains and discolorations. If you are unsure about which product to use for your carpet flooring or how you should be applying it, you can ask help from your cleaning service provider. Seal tile grouts – Grout is used to embed tiles to the floor, but since it dries up as a porous material, the exposed grout lines can quickly accumulate dirt and grime. You can seal the grout lines with a special sealant that will not only prevent filth from collecting on it but will also prevent water from getting absorbed by the grout and gradually causing damage to it. Don’t use acidic cleaners on natural stone – Some natural stone types like marble are sensitive to acid. You should therefore avoid using acidic cleaning solutions, which may dull or even damage your stone floors. Acidic cleaning agents can range from a simple water and vinegar solution to muriatic acid. Do some research before using a particular product on your floors. When it’s time to get your floors professionally cleaned again, consider Valor Janitorial Services. As one of the leading janitorial service providers in the Dallas-Fort Worth Metroplex, we have successfully cleaned over 90 million square feet of commercial and residential floors. Call us now at 214-238-9550 or send us a message through our contact page.